Steve Ditko died without ever changing his opinion about the immoral wickedness of anyone setting themselves up as an opinion-shaper, or about the pointlessness of any artist expounding upon his work by opening his mouth about it. 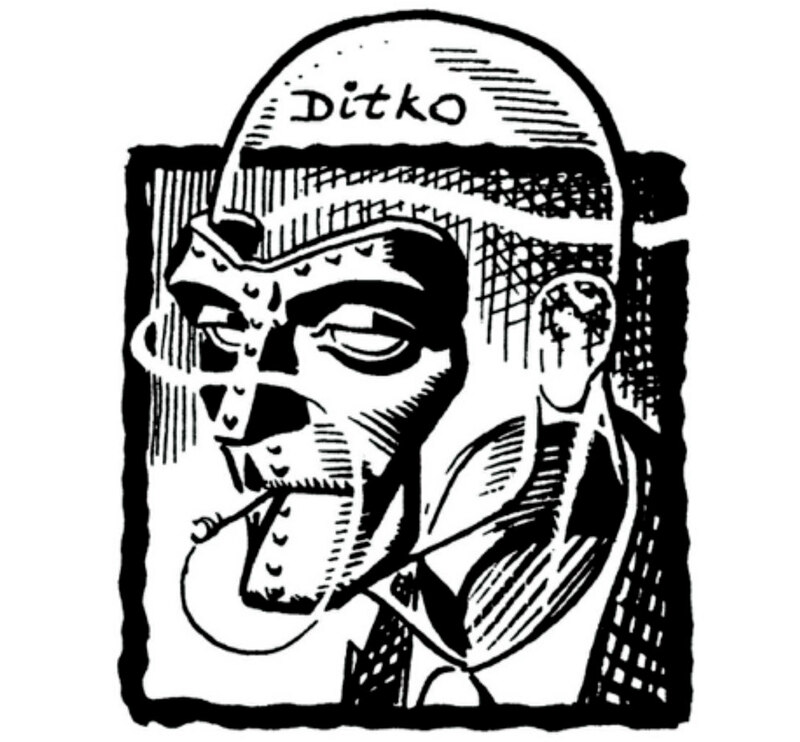 Ditko’s art spoke for him, in the literal sense that he himself never spoke on the record at all, which always seemed an idea as likely to appeal to left-ish arts critics as Ayn Rand-ian Objectivists: you want to know about me, fine, read the work. Barring any major discoveries once scholars are lowered into Ditko’s archives on ropes, it’s hard to see how the imminent biographies will differ much from the one Blake Bell wrote ten years ago, other than updated bibliographies. There is scope, though, for a look at how (as Jeet Heer has pointed out) Ditko’s faith that good people were rational world-conquerers produced Marvel Comics creations marked by surrealism and vulnerability. And perhaps, some respectful consideration that Ditko’s world view formed out of cosmic disappointment at the behaviour of every publisher and several colleagues and possibly most of the readers he ever dealt with, and that every passing wingnut stalker who barged in on his privacy was only proving his point. In any case, reducing an artist to just their programmatic beliefs is for the birds. I was consistently in the wrong place to see Ditko’s career arc as it happened, so my eventual encounter with the art of The Avenging World was like being slapped in the face with a stick, even while frowning at its political perspective; reading it again shortly after the Doctor Strange film came out made the statements that the film had captured the Ditko visual style into the stuff of unintentional comedy. No medium on Earth could do that, other than the one which did. 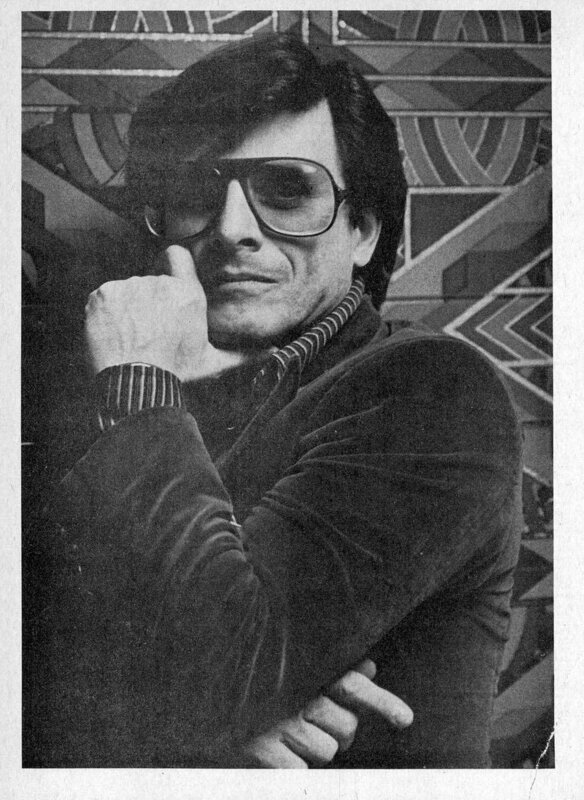 Harlan Ellison never stopped talking about himself and his work and other people and everything else, which created a few contradictions of its own; but rabble-rousers advocating for creative freedom and for writers to be fairly paid for their work are a rare enough sight, even without considering how Ellison’s stories and sci-fi hooks were catnip to film and TV producers. But in my house Ellison is inextricably linked with The Comics Journal. 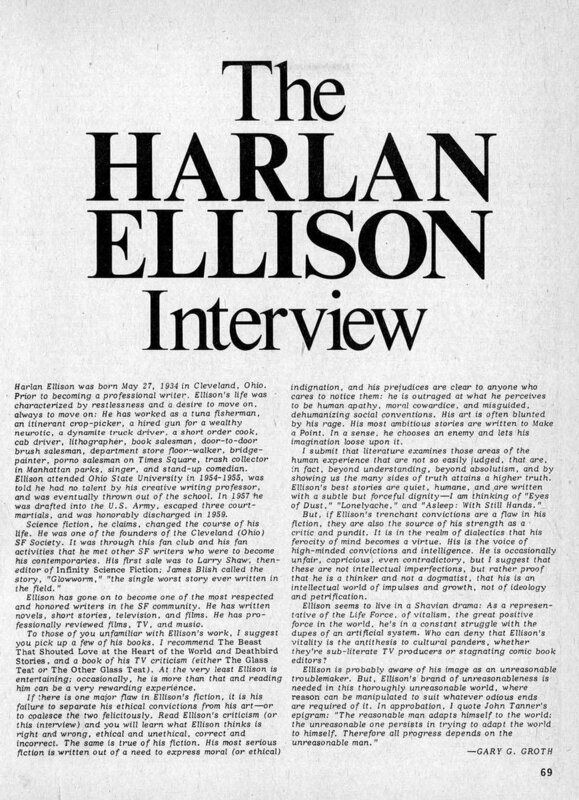 The huge, sprawling, profane interview he gave Gary Groth for TCJ 53 in 1980—my copy of which still has the £1.95 price tag from Forbidden Planet on the cover since it seems I never bothered to take it off—was a colossal overdose of information about Ellison and the unknown oceans that he swam in far to the West, as well as a most singular example of the interview as magazine-feature. It arrived just as I was preparing to switch off from comics for the best part of a decade and a half, and there are no words to describe my incredulity at discovering eons later that the interview had sparked legal ructions and inter-personal strife for all concerned. Groth’s introduction to the piece reads like Ellison’s perfect eulogy, despite being written 38 years before one was required, which says something about Ellison and something about Groth as well. But mostly it’s a reminder that the Journal is an incomparable living history of its chosen art form—all the more so for having such a bruising, adversarial relationship to it. Not for the first time, I wonder what film criticism might look like if some equivalent to TCJ had miraculously sprung up and lasted for 40 years as a guide-star for ambitious would-be writers, or at least to stand in opposition to forces insisting film criticism be a traditional conservative humanities discipline. Chances are the creation of the Disney Industrial Complex would have rolled over everything anyway, but imagine the body of writing about it that we would have to rabble-rouse with now.